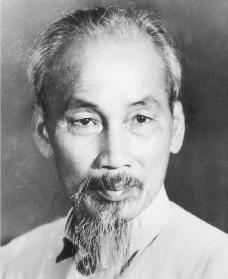 Ho Chi Minh was the founder and first leader of the Vietnamese Communist Party. He led the movement for Vietnamese independence and unity through struggles with France and the United States. He also served as president of the Democratic Republic of Vietnam from 1945 until his death in 1969. Ho Chi Minh was born Nguyen Sinh Cung on May 19, 1890, in Nghe An province in central Vietnam. Nghe An had been the center of resistance to the thousand-year Chinese control of Vietnam from 111 B.C.E. to 939 C.E. and the Ming Dynasty in the fifteenth century. Many of the leaders of the opposition to French control in the late nineteenth and early twentieth centuries also came from the province. Ho's father, Nguyen Sinh Huy, educated himself to pass the civil service exam and worked for the government. He eventually resigned in protest against French involvement in Vietnamese affairs. When Ho was ten years old, his mother died while giving birth. Ho had two older siblings, a sister named Thanh and a brother named Khiem. Ho's opposition to colonialism (the rule of an area and its people by another country) began at the age of nine, when he worked as a messenger for an anticolonial organization. His father also introduced him to several revolutionaries. Ho went on to attend the National Academy in Hué, Vietnam. Dismissed from the academy after taking part in protests against the French in 1908, he traveled to southern Vietnam in 1909 and worked briefly as a schoolteacher. Ho signed on as a cook with a French steamship company in 1911. At sea for two years, he visited ports in Europe, Africa, and the United States and began to develop his language skills, eventually learning Chinese, French, Russian, English, and Thai in addition to his native Vietnamese. During World War I (1914–18), Ho worked in London, England, and Paris, France. This is when his lifelong commitment to communism and Vietnamese independence began. Communism refers to a system in which the means of production (such as land, factories, and mines) are owned by the people as a whole rather than by individuals. Communists believe that such a system can be achieved only by revolution and government by a single party. In Paris, Ho adopted the name Nguyen Ai Quoc (Nguyen the Patriot) and attracted attention when he presented a written request to the Versailles Peace Conference demanding independence for Vietnam. Ho became a founding member of the French Communist Party in 1920. From 1920 to 1923, he was an outspoken leader of the Vietnamese community in Paris, participating in the Intercolonial Union formed under Communist sponsorship and publishing two anticolonial journals. were mostly Vietnamese students in the southern Chinese port city of Canton. The league called for independence, redistribution of land, fair taxation, and equal rights for men and women. In 1927 Ho was forced to leave Canton after a Chinese government crackdown on local communists. During his absence, the league began to split into different factions, or groups. Ho returned to South China in early 1930 to unite the factions as a formal Communist Party, drawing its members from Vietnam, Cambodia, and Laos. He continued his organizing in Hong Kong and Shanghai but was arrested by the British in 1931 and imprisoned for two years. Released in 1933, he spent the next several years in the Soviet Union. In 1940 Ho returned to South China and met with members of the Indochinese Communist Party (ICP). The following May, with most of Vietnam under Japanese occupation, he chaired a meeting of the party's Central Committee inside the Vietnamese border, marking his first return to Vietnam in thirty years. Ho and the ICP then announced the formation of the Viet Minh (League for Vietnamese Independence), an organization demanding independence from French rule and Japanese military occupation. From 1941 to 1945, although imprisoned again in China for more than a year, Ho led the ICP in seeking support for the Viet Minh, forming alliances with American diplomats and intelligence officers in South China, helping victims of a famine that killed over two million people in north and central Vietnam from 1943 to 1944, and building up the party's military forces. In August 1945 Viet Minh forces attempted to seize power in Vietnam. On September 2, 1945, Ho Chi Minh, as president of the Democratic Republic of Vietnam, stood before thousands of supporters in the city of Hanoi. He proclaimed "that Vietnam has the right to be a free and independent country—and in fact is so already." At the end of World War II (1939–45), the French tried to regain control of Vietnam. Although Ho reached a settlement agreement with the French in March 1946, calling for the creation of a Vietnamese "free state" within the French Union, the French changed their minds. In December, war broke out between Vietnamese and French forces. By 1954 the French had tired of war and sought a settlement at the Geneva Conference. In July an agreement was reached calling for a truce and division of Vietnam into a Communist north and a non-Communist south. After 1954 Ho Chi Minh remained president of the Democratic Republic of Vietnam and chairman of the Communist Party but slowly turned over day-to-day responsibilities to others. Ho was active internationally, where he promoted Vietnamese interests within other countries and attempted to prevent a split between the Soviet Union and China. A land reform campaign from 1954 to 1956 was a major failure. Modeled on land redistribution plans developed by Chinese Communists, the reforms were very unpopular among Vietnamese peasants, some five thousand of whom were killed by Ho's government in its determination to make the plan work. Ho also oversaw the formation of the National Liberation Front (NLF) in 1960, a movement of resistance against the non-Communist government in southern Vietnam. Clashes between that government and the NLF led the United States military to step in on the side of the South Vietnamese. As the American military commitment increased, with the arrival of American ground troops and the beginning of a heavy bombing campaign against northern Vietnam in 1965, Ho sought to maintain good relations with the Soviet Union and China in order to obtain military assistance and supplies from both Communist powers. Beginning in the mid-1960s, Ho Chi Minh's health declined, and he made only occasional public appearances. He never married, but he was widely viewed in North Vietnam as the father of his country and often referred to in his later years as Bac (Uncle) Ho. He died of a heart attack on September 3, 1969, almost six years before the U.S.-backed South Vietnamese government was defeated and Vietnam was unified. The city of Saigon was renamed Ho Chi Minh City in his honor. Duiker, William J. The Communist Road to Power. Boulder, CO: Westview Press, 1981. Duiker, William J. Ho Chi Minh. New York: Hyperion, 2000. Halberstam, David. Ho. New York, Random House, 1971. Kahin, George. Intervention. New York: Knopf, 1986. Lloyd, Dana Ohlmeyer. Ho Chi Minh. New York: Chelsea House Publishers, 1986. There was strong opposition in France against the attempt by its government to re establish colonialism but in claiming that the hostilities ended in 1954 because the French tired of the war is to ignore the truth of the matter.That is that the French were defeated in the decisive battle of Dien Bien Phu.This forced the French to the negotiations. Also,this article fails to mention that an agreement was made in July 1954 that there would be elections within two years which was intended to reunification.Thanks to American fears that Ho CHi Minh's Viet Minh would win these elections they never took place.